A 2-port test module that supports the SFP+ form-factor. Available in both the ValkyrieBay and ValkyrieCompact chassis. This 6-port test unir offers 2 x 10GE ports and 4 x 1GE ports. Only available in the ValkyrieCompact chassis. This popular test module offers 6 x 10GE ports that support the SFP+ form factor. This 5-speed test module supports both 10GE and the new 5 and 2.5GE speeds, in addition to 1GE and 100Mbps. A 2-port test module that supports the RJ45+ form-factor. Factory upgradable to 6 ports..
A 6-port test module that supports the RJ45+ form-factor. This high-density test module offers 12 x 10GE ports (via 3 QSFP cages). This test module offers 6 x 10GE ports that support the XFP form factor. 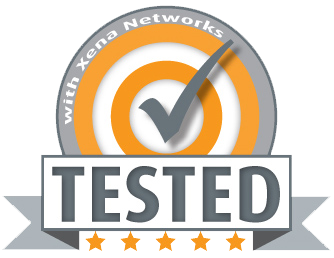 Xena’s test solutions are renowned for their price/performance – you get a lot of great features at a very affordable price. To help you evaluate our 100GE solutions we are happy to offer free online demo session where we walk you through all the software and answer any questions you might have regarding your specific test scenario.